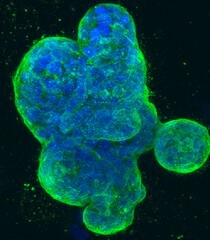 Three-dimensional culture of human breast cancer cells, with DNA stained blue and a protein in the cell surface membrane stained green. The cancer in these cells is driven by the ErbB2 gene. This image was originally submitted as part of the 2015 NCI Cancer Close Up project and selected for exhibit.